While avalanches are sudden, the warning signs are almost always numerous before they let loose. Yet in 90 percent of avalanche incidents, the snow slides are triggered by the victim or someone in the victim's party. Avalanches kill more than 150 people worldwide each year. Most are snowmobilers, skiers, and snowboarders. Many avalanches are small slides of dry powdery snow that move as a formless mass. These "sluffs" account for a tiny fraction of the death and destruction wrought by their bigger, more organized cousins. Disastrous avalanches occur when massive slabs of snow break loose from a mountainside and shatter like broken glass as they race downhill. These moving masses can reach speeds of 80 miles (130 kilometers) per hour within about five seconds. Victims caught in these events seldom escape. Avalanches are most common during and in the 24 hours right after a storm that dumps 12 inches (30 centimeters) or more of fresh snow. The quick pileup overloads the underlying snowpack, which causes a weak layer beneath the slab to fracture. The layers are an archive of winter weather: Big dumps, drought, rain, a hard freeze, and more snow. How the layers bond often determines how easily one will weaken and cause a slide. Storminess, temperature, wind, slope steepness and orientation (the direction it faces), terrain, vegetation, and general snowpack conditions are all factors that influence whether and how a slope avalanches. Different combinations of these factors create low, moderate, considerable, and high avalanche hazards. If caught in an avalanche, try to get off the slab. Not easy, in most instances. Skiers and snowboarders can head straight downhill to gather speed then veer left or right out of the slide path. Snowmobilers can punch the throttle to power out of harm's way. No escape? Reach for a tree. No tree? Swim hard. 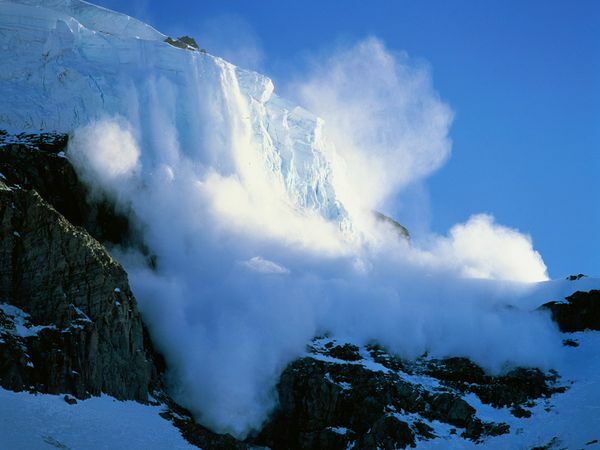 The human body is three times denser than avalanche debris and will sink quickly. As the slide slows, clear air space to breathe. Then punch a hand skyward. Once the avalanche stops, it settles like concrete. Bodily movement is nearly impossible. Wait—and hope—for a rescue. Statistics show that 93 percent of avalanche victims survive if dug out within 15 minutes. Then the survival rates drop fast. After 45 minutes, only 20 to 30 percent of victims are alive. After two hours, very few people survive.